This is definitely my favourite find for this week. This gorgeous photo was taken by Aussie photographer Jason Loucas and comes via the city sage blog. Two weeks to go until we move into our new home and Ive been thinking a lot about decorating. 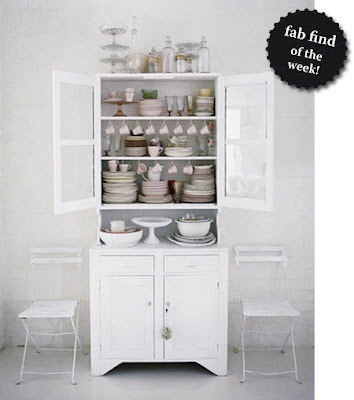 This is a must - a china hutch painted all white. I agree with you, I myself have a lot of white painted furniture at home, the best is to get an old piece and do it up yourself!! good luck with the moving! !